Monday morning, 5:31 AM: I am one minute after the opening of the pool, and every lane already has two people in it. The crowd at the pool varies; we regulars tend not to miss, and every once in awhile new people show up for a day, or two, or a couple of weeks. The contingent that just raced the half-Ironman in Oceanside took a few days off; the husband of the husband-wife pair in Lane 1 had an absence last week. There’s always a high school science teacher in Lane 2: it took Bill and I a couple of conferrals but we finally identified him. Helga comes around 6:00 AM and swims in Lane 1 or 6; this older German woman is one of my favorite partners in a lane. The Masters and triathletes usually do intense lifeguard-led workouts in the middle. When I am in Lane 5, I watch Ruth as much as I can, a 60-something Ironwoman whose stroke is powerful and gorgeous. Her hands hit the water with just the right sound. I am not much of a swimmer—or wasn’t, until recently having worked my way up to 3500 yard swims—but I know that sound is right because there is a certain authentic ring to it. We know beauty when we hear it, or see it; when there is a rightness in the universe, it sends off waves that vibrate with truth. There’s never any way to fake those kinds of waves, be they sight or sound, not really. It’s like the voice, in writing. What’s authentic and real…is always clearly so. We hear it, and we just know. It is a light all its own. In a blog entry that will largely be about voice, I return now to the pool at 5:31 AM on Monday morning, to a scene that shall be nearly wordless. The destiny on this Monday morning, a morning in which every lane has at least two already, is a circle swim. I’ve learned to like those. Intense little buggers, the circle swims. Everyone seems faster than I am, except the once-in-awhile occasion when they’re not. My first few circle swims struck me as the most awkward social situations I’ve ever been in. Not really, but you know what I mean. It’s rare that three or more people in a lane are all going to have the same pace. There’s passing, pulling over, feeling chased, trying not to chase, and communication to deal with. A person learns quickly to get over herself. Often circle swims end up being a better workout for me because I have to push myself (to try) to keep up with better swimmers. I choose the lane with the teacher; he gets out shortly after 6:00 AM, and so I figure that I will be circle swimming for only half an hour and then the remaining guy and I can just do a lane split. Even though the two men are going at a clip that will push me, it’s the surest bet. Popping in, I go a few rounds. The teacher and the young man are ripping through the water. Eventually the young man (late high school/early college?) pulls over to the wall. I figure that he is being polite, perhaps letting me go so I can have a couple of more moderately paced laps. His goggles are off and his eyes shine a bit. In fact, besides noticing how incredibly fast his arms were pulling, his eyes were the first part I really saw. Pool water has tousled his dark hair. “Oh, please go ahead,” I say, “you are faster than I am!” He smiles brightly. “Nah, I need to rest a bit,” he says without any irony, just a remarkable sense of presence. You know those people, right? The shiny-eyed ones that handle life’s adventures with a sort of mirth and strength combined? As I swam away, I thought to myself about how I had just found another one of those, which is always cool. I like to find those people. They glow in the dark. It’s on the way back to the starting wall, where this guy is still hanging out, that I see underwater for the first time: all of his left leg from the knee down….is gone. Flashing water, foggy goggles, sleepy brain. We’d gone multiple laps together, and I hadn’t noticed. His strength as a swimmer and his eyes stood out, like the waves that ring true. What I will not do now is turn this into a morality tale: person with hardship reminds us all how good we really have it. I find those tales repugnant. Using someone’s hardship to build yourself up and make your life seem a little better by fallacious comparison/contrast? Nope. Human exceptionalism does no one any favors: we are exceptional neither in our hardships nor in our graces. We just simply are. And this young man? Totally strong and badass. (I would ask to excuse the language, but there’s truly no other word for it). I get to be merely the recorder. I spend quite a bit of time these days—charging up hills, having a good run, starting daily with my health and life in control, schlepping the kiddos hither and yon without batting an eyelash—feeling fairly badass myself. Endorphins do that, and I’ve had more than my overshare of Facebook posts hopped up on post-athletic hormones celebrating newfound (for me) strength and the freedom I find. I took my life and pulled it together right when unhealthiness and anxiety could have spiraled into chaos. That’s pretty wicked, and I’m pretty enduringly proud of such a huge change. I remember what that willpower and work signifies on days now when I don’t feel I have it quite together! I am sure that voice of rollicking freedom isn’t everyone’s cup of tea. Or coffee. Or milkshake. Or whatever. There’s no malice in that voice; in fact, the soundtrack in the back of my mind is less punk and more often more along the lines of Matthew Wilder’s hit: “Ain’t nothin’ gonna break my stride/Nobody’s gonna slow me down, oh-no/I got to keep on moving/Ain’t nothin’ gonna break my stride…” I am a child of the 80s, so I can’t comment on taste here. Voice on social media is a tricky deal. I’ve always viewed my Facebook and Instagram (which I use more lately) as a scrapbook/journal of sorts. In other words, social media is mainly to chronicle moments with the audience (most of the time) intended to be myself. In college, I was sitting in my history of rhetoric class one day when we all began to discuss how a journal and our voice would evolve should that journal be for public, versus private, consumption. That question is more relevant now, than ever. I try not to use social media for PSAs, contributing negativity to the world, spreading wanton memes, or politics. But I am sure my voice, to some, can be just as annoying. That’s okay. How we choose to curate our lives artfully won’t reach a chord with everyone. And we cannot get away from the fact that, at best, the use of social media is a constant dance around the barbed wire fence of narcissism. Then again, so is any art form or version of self-expression ever in the world. Just when I think, though: “Who am I to make this expression?,” I remember that the flip side is this: “Who am I NOT to express my truth?” If we each are part of the mechanism by which the universe understands itself, then we might make the case that we have at least part of an ethical imperative to record our sense impressions, perceptions, and experiences as a form of data gathering and processing. Expression and information gathering/recording can be some heavy lifting—it’s good when we all participate. I am a born expresser. Expression allows, for me, a sense of appreciation for what is good. My voice is always ready. My hands want always to write. Which is precisely why I think it is important to cultivate a purposeful silence every once in awhile. To have the voice, but to keep it quiet deliberately. Balance. I first experimented with this in February, going silent on Facebook and Instagram for a full week. This week, I’ve captured the silence since Sunday. In the absence of using my public voice, or rather, my voice in public (two different things, and only one authentic), what could I observe, hear, and understand differently? What does it do to hold the tides of expression back, to observe without immediate comment? For me, to hush my voice a bit means that I go looking for other stories to tell. I feel the thrill of hunting for other main characters, heroes that are, essentially, outrageously awesome and that I think the world needs to know about. My heroes are strong, courageous, and making life better for those around them. At the track for interval work on Tuesday, I watched the lacrosse team practice and wondered why part of the track team appeared to be sitting in the bleachers. 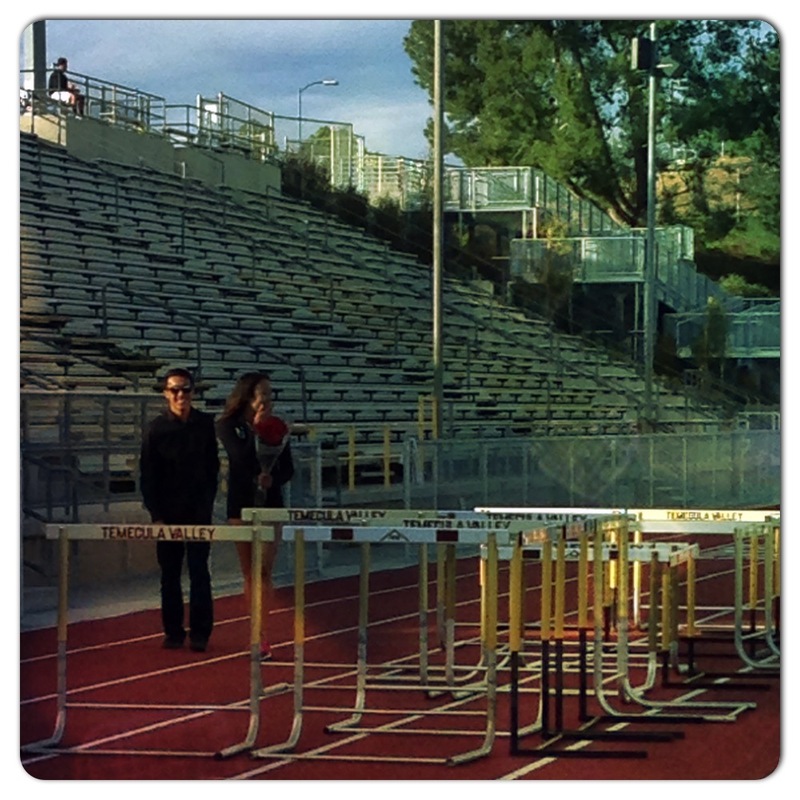 On my 5th 200, the track team began arranging hurdles. Uh-oh, I thought, they are getting ready to jump, so I’d better get done. When I looked back, however, the hurdles were all in a clump, some odd configuration that, clearly, was not for jumping. It dawned on me: the track team was using the hurdles to spell something! After studying a bit, I realized they had spelled out “P-R-O-M.” A couple of boys held signs. There were murmurs of a girl who would be arriving for practice. An upperclassman appeared carrying a bouquet of roses. Ah. He is going to ask this girl to prom, and he has planned this whole memory for her. Were they friends about to become more? Had they already been dating? (Judging by her reaction later, I think it may have been the former, actually). I snapped this picture on my phone, feeling immeasurably lucky that I happened to be in the right place at the right time to watch this magic unfold. We forget, maybe, how much courage it takes to declare yourself to someone else. Seventeen-year-olds are some of my favorite people on Earth, for the very reason that they are capable of taking plunges like this. I felt I got to witness the best of someone right here, as well as the excitement of friends buzzing around and pulling off something that they’d spent time planning. 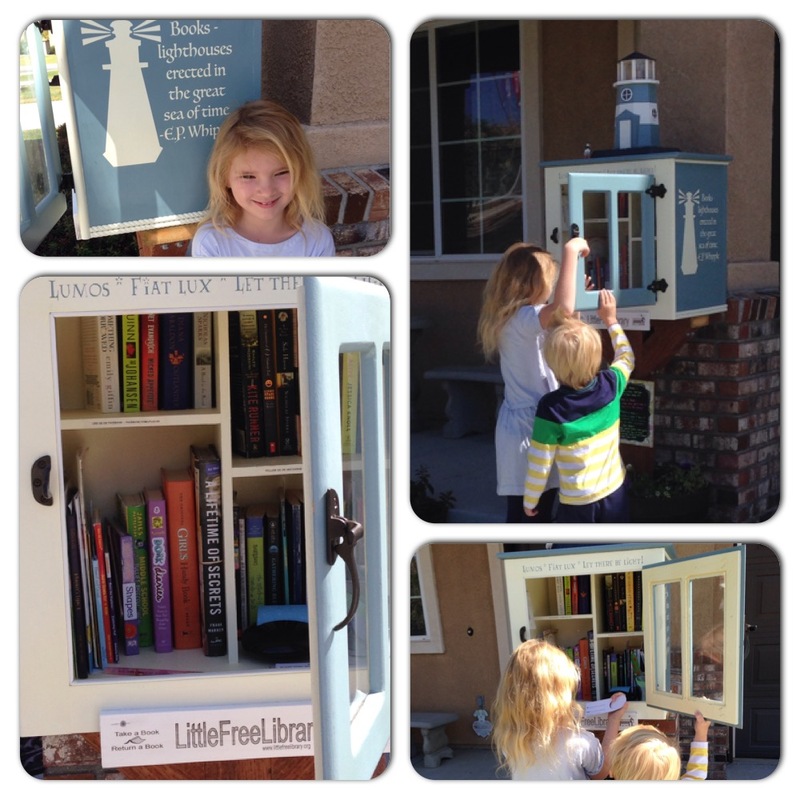 Yesterday we went to visit for the first time a new Little Free Library, charter #22195, in town. Erin Brady curates this library, which she and her husband Rocky built by hand. If ever there were a heroine, Erin would be one. Her library’s name is Lumos Fiat Lux, and it is near Great Oak High School. Let there be light. Indeed. Erin’s library is a work of art, in every way. Her attention to detail can come only from a passionate love not only for books, but for the people who read them, for an educated humanity itself. She loves lighthouses and travels to see them; the theme of light winds its way throughout her library. Her guest book? Composed of a cover that looks like a library card and filled with all kinds of school papers: graph paper, handwriting paper, card stock, etc. She lives on Puffin Street; accordingly, there is a little puffin figurine demurely by the lighthouse, a little visual play on words: we cannot forget that Puffin is a major book publisher (an imprint of Penguin), as well. She has free bookmarks and pencils. Her books are stamped with a Little Free Library custom stamp. Papers inside give an amiable explanation of how LFLs work. It is not necessary to leave a book in order to take out a book, although we have a book we are now planning to bring over as soon as get a chance. As any good librarian might, Erin observes moments like Pet Week and sometimes arranges the books by theme. This library is, in total, an amazing labor of love and time. And beauty. The hooks, hinges, and craftsmanship… I am new to Little Free Libraries, but there is a whole network of them. I am in a mind to visit many more. Lumos Fiat Lux enchanted all three of us. If you live in Temecula, seriously, this is a treasure not to be missed. If we lived on that side of town, we would be walking past it ALL the time. As it is, we cannot wait to drive back over. Erin has painted a quote from A Wrinkle in Time on one side of the cabinet: “A book, too, can be a star, a living fire to brighten the darkness, leading out into the expanding universe.” If the lives of my three main characters this week comprise stories of their own, then one could say that the Swimmer, the Prom Date, and the Little Free Librarian are exactly stars: lights that cast something better into our expanse of space and time. When we are silent, we can see the stars. We can see and appreciate them using our voice, too, but perhaps those stars shine all the brighter when we quiet ourselves long enough to reflect and refract their stories. The balance of expression is observation. Whatever we observe, we change; whatever we express changes even further as we struggle to put light into words. Silence is the great moment in which we take in the light, let it become part of us, and decide to become its mirror. I have a little tear in my eye and a smile in my heart. I am so honored that you wrote about our little library, so in awe of your way with words, and so grateful that you and your light exist. Please let me know if it would be okay with you for me to share on the library’s FB page. If not, I would completely understand.